I am beginning to believe that in countries like the UK, where direct-to-consumer (DTC) advertising is not permitted, pharmaceutical companies have used the bundles of dough they save by not advertising on the tellie to manipulate public opinion in other, more creative and consumer-centric ways. Such as creating and funding so-called "grassroot" patient organizations that lobby and promote on behalf of their donors. "Patient groups that have been among the most vocal in spearheading attacks on the National Institute for Clinical Excellence (Nice) over decisions to restrict access to drugs on the NHS depend for up to half of their income on drug companies, but details are often undisclosed. "The growing clamour over decisions by Nice to ban access to certain drugs has outraged patients and the public, and undermined confidence in the NHS. "Protests have been launched by charities including the National Kidney Federation, the Arthritis and Musculoskeletal Alliance, the National Rheumatoid Arthritis Society, Beating Bowel Cancer, the Royal National Institute for the Blind and the Alzheimer's Society. All of these charities received sums of up to six figures from drug companies in 2007. 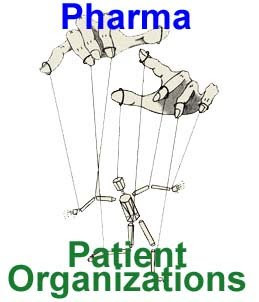 "The extent of the drug companies' support for the smaller charities has led to criticisms that supposedly grassroots patient organisations are puppets of the pharmaceutical industry, being used to bludgeon Nice into making the drugs available on the health service. A positive decision by Nice on a drug not only guarantees sales to the NHS but can influence global markets worth billions of pounds. "Yet none of the charities named has criticised the high prices charged by the pharmaceutical companies for their products in their recent campaigns." The color scheme of the RLS Foundation's Web site matches that of the Requip product site. I guess pharma donations of "up to six figures" -- hundreds of thousands of dollars -- to UK or US "grassroots" patient groups are small peanuts compared to the 9-10 figure sums spent on TV DTC ads. But 6 figures here and 6 figures there, and pretty soon we're talking 7 to 8 figures, right? And six figures worth of advocacy from a targeted patient group is at least ten times more effective than the same amount wasted on DTC ads (see "Is DTC Bankrupting Pharma?"). Yet, all this is insignificant when compared to the 12 figures -- $700,000,000,000! -- that the US government is robbing from the poor to pay the rich. P.S. Patient groups and healthcare charities whose existence and good work relies on donations from individuals and organisations have denied that they are in any way obliged to fight the pharmaceutical industry’s corner in return for financial support. (see "Charities not in the pocket of pharma").